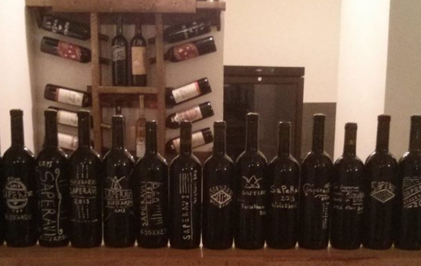 The first tasting organized by Ukrainian press simultaneously on 2 continents. 30.04.2016 (Hvino News). 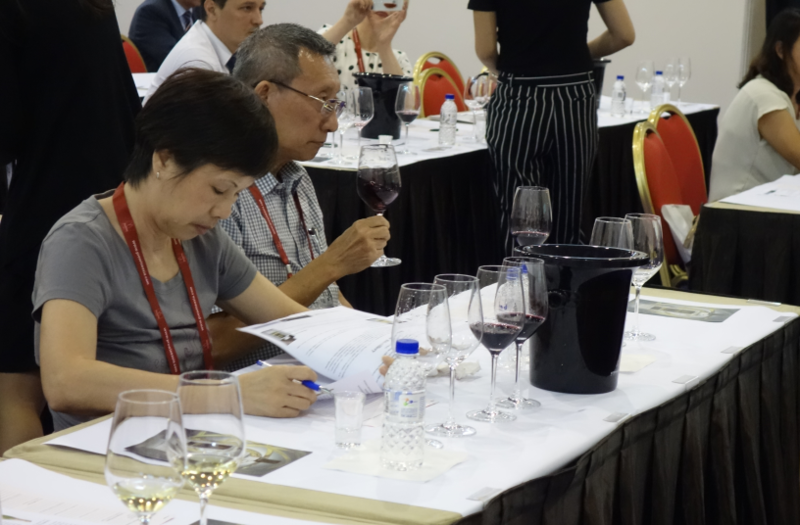 In April, two significant events took place in the world of wine: Jubilee 50th Vinitaly exhibition in Verona and the inaugural edition of ProWine ASIA in Singapore. Ukrainian D+ Communication Group represented the Ukrainian press at both events, providing tastings at two continents. DRINKS+ presentation on "Wine Tourism as a Marketing Tool in Countries of Evolving Winemaking: Georgia, Moldova, Ukraine" was supported by partnership of Hvino.com (Tbilisi), Winerist.com (London) and drinks.ua (Kiev) portals. The presentation in Verona was held on April 12, and conducted by DRINKS+ special project managers Eugenia Rodionov and Julia Laznyuk, and professional sommelier and wine travel guide Anna Alexeeva. The participants tasted Ukrainian wines: Koblevo Reserve ( "Bayadera Group" holding) and Krimart traditional method sparkling wines by Artemovsk Winery. Wine critics, oenologists, sommeliers, distributors who participated in the tasting gave highly positive feedback about the quality of Ukrainian wines, and claimed interest in cooperation with the producers. 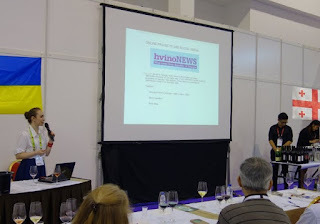 In Singapore, the presentation was held by chief editor of DRINKS+ magazine and drinks.ua portal Marina Mayevska. Distributors, horeca and wine schools representatives, and the press came to learn about winemaking of the Black Sea region. They tasted Charte Komilfo fruit flavored sparkling wine range from Artemovsk Winery, red wine from Georgia by Gevelli company, and Prime vodka by Olymp company (Ukraine). Participation of D+ Communication Group received positive estimation of ProWine ASIA, and representatives of the Ukrainian diplomacy in Singapore. Grab your drinking horn and learn about this fascinating region! 29.04.2016. When you arrive at passport control in the Tbilisi airport, a border agent checks your documents, gives you a once-over, and hands you a bottle of wine. I’m not actually sure if this is always the case, but it was when I landed in the world’s self-proclaimed “Cradle of Wine” this January. The region we call Georgia has seen a lot of change in its millennia-long history: an early move from Zoroastrianism to Christianity, golden ages of empire and military strength, foreign incursions from Mongols, Ottomans, Safavids, and Russians, contested borders, uprisings against the USSR, corruption, and periods of economic depression. One thing, though, has remained constant since the beginning – the traditional qvevri method of winemaking, so old and so Georgian as to be added to the UNESCO list of intangible cultural heritage in 2013. This wine is so much a part of their heritage that the wine bottle at the border is an official initiative by the Ministry of Economy and Sustainable Development. And the label of the wine bottle at the border contains facts about Georgian history. To be clear: it’s not a history pamphlet with a few words about wine – it’s wine, with a few words about history. Frank ROEDER, Master of Wine: "You will get many friends"
27.04.2016 (Hvino News). In March 2016 the UK-based Institute of Masters of Wine sent its delegation to Georgia. The first “Masters of Wine Trip to Georgia”, organized in cooperation with Georgian Wine Association, was a highly professional event, which envisaged retrospective tastings of indigenous grape varieties as well as microvinifications of high-quality rare Georgian varieties. Hvino News has interviewed the participants of “Masters of Wine Trip to Georgia”. Read the first three interviews here, here, and here. Today we publish the final fourth interview from this series, wishing to thank the Institute of Masters of Wine for invaluable support. Our guest is Frank ROEDER, Master of Wine, who kindly agreed to share impressions about trip to Georgia. Hvino News: Please tell us about yourself. How a person becomes a Master of Wine? What made you enter into the world of wine? Frank Roeder: In 1990 I founded my own wine trading company VIF, which was initially focused only on French and Italian wines. With the upcoming success we expanded the portfolio also to wines from Germany, Spain, Portugal, Austria, Luxembourg and overseas. I was always interested in knowledge about wine and wanted to know more than just reading books and visiting producers. That’s why I started to study the WSET Diploma and as a consequence to become a Master of Wine. This content has been removed from Hvino's news aggregation system per author's request. bilisi’s old town up Metekhi Rise leaves you with any breath at all, be prepared for the view from its heights to rob you of it. Before you a broad swath of this wildly romantic city, old and new, unrolls like an exotic carpet — from the gracefully curving Mtkvari River and its incongruously modern Reebok sneaker of a bridge to the ancient and still imposing Narikala Fortress perched on an opposing hilltop. We’ve made the ascent to this tidy, up-scale neighborhood because we’ve heard whispers of a little-known wine bar offering natural wines made by peasant vintners from indigenous Georgian grapes (with Armenia, Eastern Turkey, and northern Iran, Georgia shares the world’s oldest wine culture), but finding it proves challenging. 23.04.2016. Vinexpo is held in Bordeaux in uneven years and with 17 exhibitions it has developed into the world’s leading show for wine and spirits professionals, as demonstrated by the increase in its attendance figures. 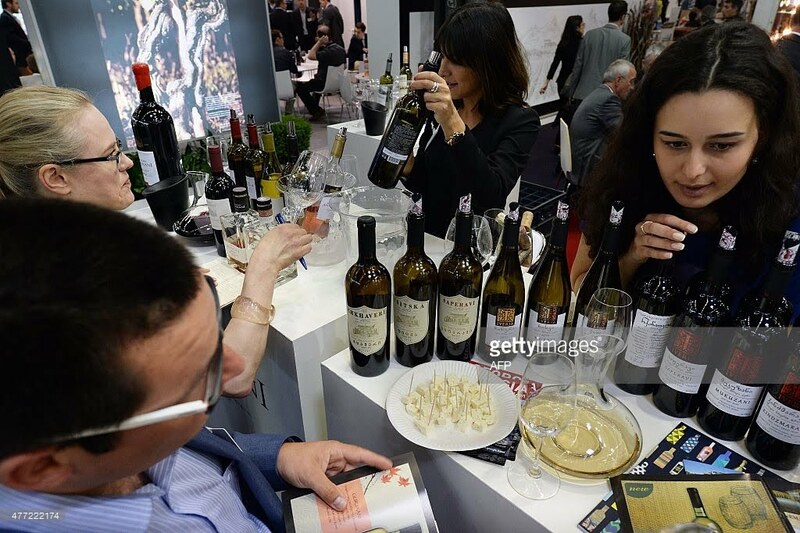 Last year Georgian wine took its first part at world’s important wine exhibition. Forbes published an article by Adam Morganstern about Vinexpo saying that “One way to measure the effectiveness of Vinexpo is the example of Georgia”. “The former Soviet state has the distinction of being the world’s oldest-known wine producer, yet is little heard of in many foreign markets,” reads the article. 21.04.2016. 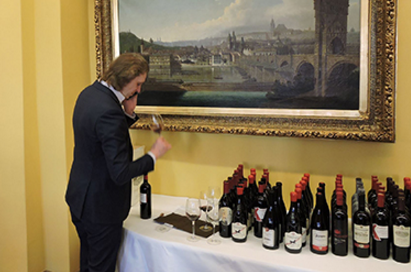 The Real Wine Fair, the natural wines international exhibition, held in London, the United Kingdom. With support of National Wine Agency of the Georgian Agriculture Ministry, seven Georgian winemaking companies producing natural wines have taken part in the exhibition – Atenuri; Iago Bitarishvili; Iberieli; Mandili; Nikoladzeebis Marani; Okro’s Wines; Pheasant’s Tears. The exhibition has also introduced two Georgian events – tasting of Georgian wines and the Georgian Supra. About 200 interested bodies attended the Georgian wine tasting event, including importers, distributors, representatives of restaurants and wine bars, media reporters. As to the Georgian Supra event, the visitors were able to taste Georgian dishes, besides Georgian wines, and listen to Georgian folksongs. 19.04.2016. More Chinese consumers will soon be able to taste and enjoy Georgian wine and learn about the country’s rich winemaking culture following a deal by Georgian and Chinese envoys to increase the presence of Georgian wine in China. 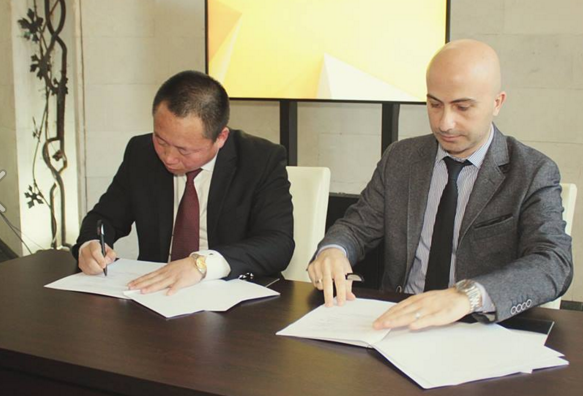 A Memorandum of Cooperation was signed between the Georgian National Wine Agency (NWA) and Georgian Wine Centre in Nanchang, the capital of Jiangxi Province in south-eastern China. The Memorandum outlined strengthening bilateral cooperation to raise awareness of Georgian wine and improve its export opportunities in China. 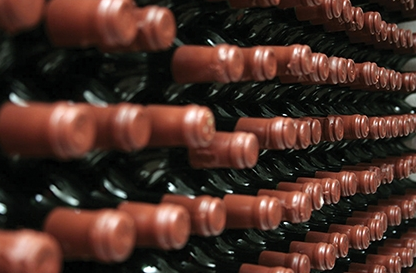 To achieve this, a new Georgian wine centre will soon open in Nanchang city. The NWA said construction of the new wine was already completed and the facility was ready to be officially opened. The centre is located on 1,600 m2 territory and includes wine tasting rooms, a space for Georgian wine companies’ representations, exhibition halls, a museum and a restaurant. 18.04.2016. There are certain criteria for guests invited to dinner at Alice Feiring’s railroad one-bedroom, fourth-floor walk-up in a former tenement on Elizabeth Street in Manhattan. Christopher DONALDSON, Master of Wine: "Georgia must persist in higher quality/lower volume export route"
17.04.2016 (Hvino News). In March 2016 the UK-based Institute of Masters of Wine sent its delegation to Georgia. The first “Masters of Wine Trip to Georgia”, organized in cooperation with Georgian Wine Association, was a highly professional event, which envisaged retrospective tastings of indigenous grape varieties as well as microvinifications of high-quality rare Georgian varieties. Hvino News has interviewed the participants of “Masters of Wine Trip to Georgia”. Read the first two interviews here and here. Today we publish the third interview from this series, wishing to thank the Institute of Masters of Wine for invaluable support. 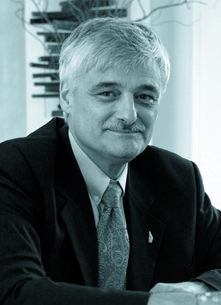 Our guest is Christopher DONALDSON, Master of Wine, Sales Director at The Royal Tokaji Wine Company. He kindly agreed to share impressions about trip to Georgia. Hvino News: Please tell us about yourself. Are you from a winemaker’s family? What made you enter into the world of wine? 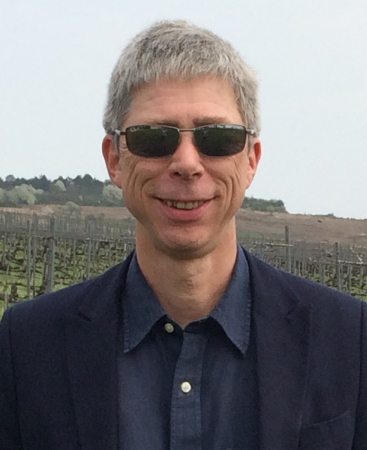 Christopher Donaldson: I was born and raised in London, my parents were interested in wine as consumers and were members of The (UK) Wine Society. So I was brought up to drink wine with meals, mainly from the classic European regions. From a professional point of view, my uncle was a hotelier and restaurateur which enabled me to enter the hotel industry. In my studies I encountered wine, and was inspired and hooked. 16.04.2016 (Hvino News). Georgian expert Ana Godabrelidze has been elected as Vice-President of the Commission of Alcoholic Beverages of the International Organization of Vine and Wine (OIV). Ana Godabrelidze is head of tasting committee of the National Wine Agency of Georgia. She was nominated to the OIV position on April 12. This is the first case when a Georgian expert occupies such an important position in this field. The OIV unites 46 countries and 12 supervisory organizations. 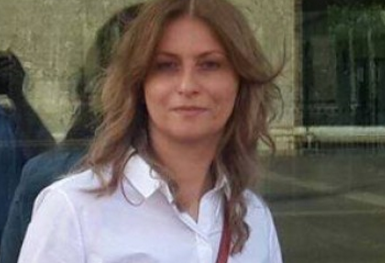 Anna Godabrelidze graduated from Bordeaux Montesquieu University (France) with wine master's degree; she worked at wine companies and research institutions. She has extensive experience in international projects. 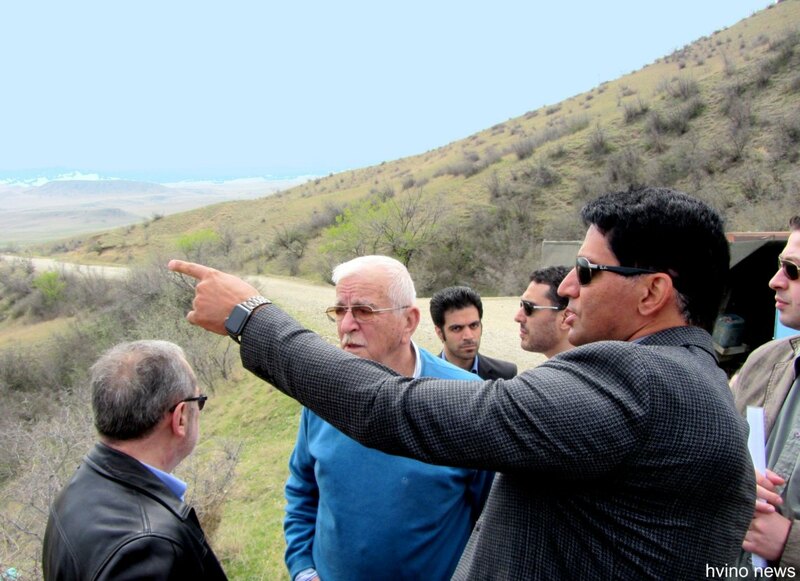 "The first Georgian expert has occupied this position and this fact is very prestigious and encouraging for Georgia. At the same time, we will have more access to all directions, be it legislative and other directions", - Ana Godabrelidze said. 15.04.2016. (Hvino News). Eight Georgian wineries are currently being showcased at the 7th annual Wine and Gourmet Japan exhibition in Tokyo on April 13-16. This was the second time Georgia participated in the Wine and Gourmet Japan trade show. 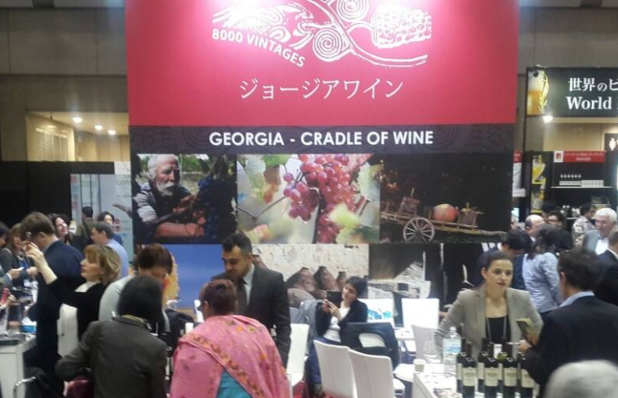 Georgian delegation has become stronger compared to country's debut in 2015 with six companies (see Georgia debuts at Wine and Gourmet Japan exhibition). Represented companies are: Tbilvino, Wine Man, Bagrationi 1882, Kindzmarauli, Tsereteli Wine & Spirits, Maranuli, Dugladze and Besini. The three-day Wine and Gourmet Japan has become Japan’s hub for national and international wine, beer, spirits and traders in the gourmet food industry. In 2015 Georgia exported 138, 290 bottles of wine to Japan – a five percent increase compared to last year's level. 14.04.2016. 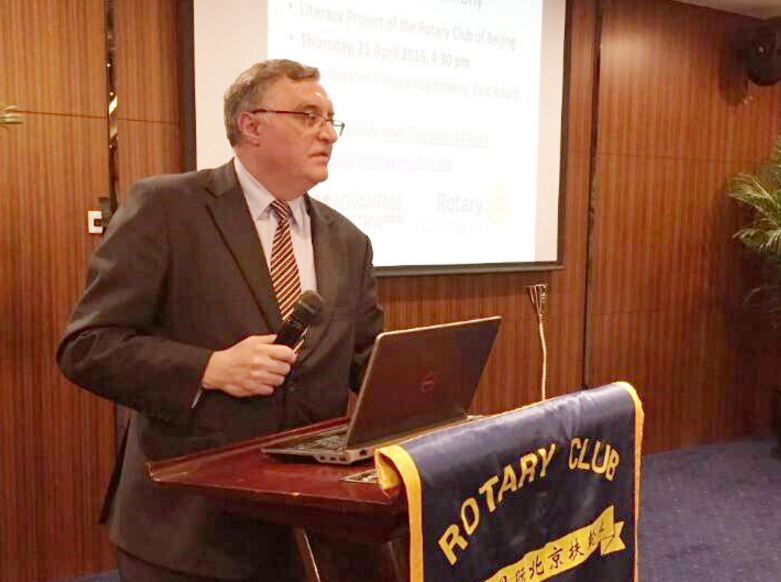 Twelve Georgian wine varieties were sampled by guests at a Rotary Club of Beijing meeting, which brings together people from all walks of life to provide humanitarian and community service. Georgian Ambassador Dr. David Aptsiauri took part in the event. Georgia’s Ministry of Agriculture said efforts to raise awareness of Georgian wine in new export markets was starting to pay off. "This was one more step forward in raising awareness of Georgian wine in China,” reads a press statement from the Ministry. After sampling the Georgian wine and learning about the country’s rich winemaking traditions, the Rotary meeting ended with a charity auction. One of the items up for auction were bottles of wine from six Georgian wine producers donated by the National Wine Agency of Georgia. Rosemary GEORGE, Master of Wine: "Keep up the good work!" 11.04.2016 (Hvino News). In March 2016 the UK-based Institute of Masters of Wine sent its delegation to Georgia. The first “Masters of Wine Trip to Georgia”, organized in cooperation with Georgian Wine Association, was a highly professional event, which envisaged retrospective tastings of indigenous grape varieties as well as microvinifications of high-quality rare Georgian varieties. Hvino News has interviewed the participants of “Masters of Wine Trip to Georgia”. Read the first interview here. Today we publish the second interview from this series, wishing to thank the Institute of Masters of Wine for invaluable support. 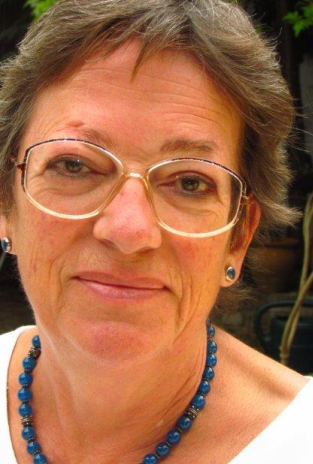 Our guest is Rosemary GEORGE, Master of Wine, a freelance wine writer and author. She kindly agreed to share impressions about trip to Georgia. Hvino News: Please tell us about yourself. What made you enter into the world of wine? 10.04.2016. The new online wine shop Bino.ge began operating on the Georgian market. The company’s Director Giorgi Kumsiashvili says that the online platform was launched a month ago and currently the base includes 14 wine companies. The head of Bino notes that the customer demand is the same both for average and high price products. 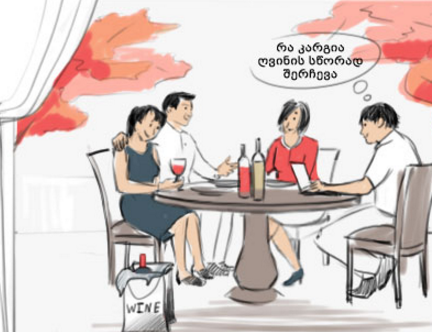 Bino provides a customer with specific information about each wine. According to him, he presented the online store idea at "Start-up Marani“ event and one of the potential investors expressed his willingness to cooperate. Commersant was interested in the local wine companies’ opinion about this innovation. Georgian companies consider online wine sales promising. 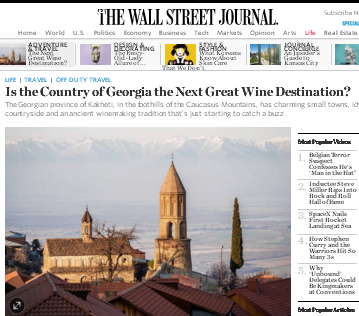 "The Wall Street Journal": Is the country of Georgia the next great wine destination? 10.04.2016. The Georgian province of Kakheti, in the foothills of the Caucasus Mountains, has charming small towns, idyllic countryside and an ancient winemaking tradition that’s just starting to catch a buzz. It was 9:30 in the morning and I was already tipsy. At Twins Old Cellar Winery Hotel in Napareuli, a one-road village of stone houses and overgrown pomegranate trees in the Georgian province of Kakheti, breakfast came with an all-but-mandatory free wine tasting. For Eldar Ramishvili, the hotel’s ebullient manager, a taste meant three full glasses. Traveling through Georgia, the tiny post-Soviet country set between the Caucasus and the Black Sea, is always a metabolic endurance test. Wine, brandy, chacha—a grape-skin moonshine with the flavor of gasoline schnapps—all these are habitually, exuberantly, foisted upon any foreigner who sits still long enough. But in the country’s primary wine region of Kakheti—according to Georgians, the birthplace of wine itself—consumption seems to be the primary occupation. 08.04.2016. Georgia is continuing to penetrate world markets with its traditionally-made wine and brandy, as new markets open up to import the Georgian drinks. 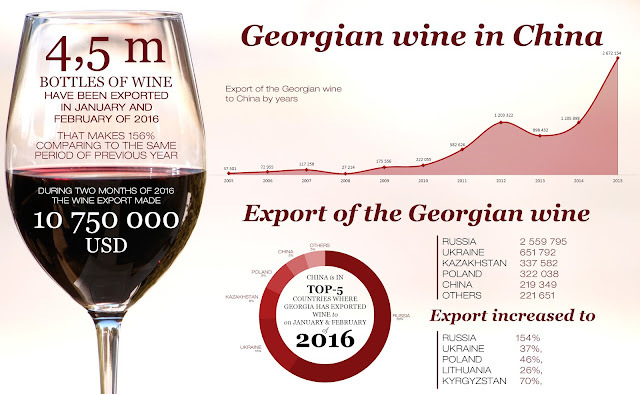 Already this year Georgia exported more than seven million bottles of wine to 26 countries, which generated $18.14 million USD income for the country. This was a 51 percent increase in wine exports in January, February and March 2016 (Q1) than in the same months of 2015, reported the Georgian National Wine Agency. The extra exports saw the country earn 20 percent more income than in Q1 2015. In the first two months of this year 21 countries imported Georgian wine however last month an additional five countries also imported the products, announced the Agency today. 08.04.2016. Georgian wine is continuing to make an impression around the world; next destination – Baltic countries. Georgia’s National Wine Agency announced a number of events were planned to raise awareness of Georgian wine in countries across the Baltic Sea, such as exhibitions and wine tasting events where Georgian wine will be proudly presented. Initially the Agency will promote the traditionally-made Georgian drink in Lithuania, Latvia and Estonia. Baltic countries are one of the interesting export markets for Georgian wines. Different campaigns and activities are planned for these countries, which would increase Georgian wine sales there,” said head of the Agency's PR and marketing department Irakli Cholobargia. The Agency reported today Georgian red wine will be showcased in Latvia's capital Riga, after making an impression in Lithuania and Poland recently. Why is China such an important market for Georgian wine? 06.04.2016. China’s wine consumption will grow from 40 percent to 60 percent by 2018, according to the study published by economists in the University of Adelaide’s Economics Research Center. While rice wine has traditionally been the most common in Asia, income growth in China and a preference swing toward grape wine is gradually changing the region’s consumption situation. China exports approximately 300 billion bottles annually and the top five importing countries are France, Australia, Spain, Chile and Italy. 04.04.2016. Georgia’s National Tourism Administration agency is set to re-launch a national wine route project aimed at documenting and evaluating the country’s countless numbers of wine cellars. The project includes adding new wine tourism facilities to the electronic database, as well as installing directional and road signs for the individual wine cellars. The agency will also reach out to small family-owned wine cellars and provide courses on the history of Georgian wine and winetasting methods, as well as basic skills on accounting, financing and foreign language skills. Promotional materials such as wine routes maps and guides will be distributed for free on the agency’s Website and at tourism information centers across the country. Rod SMITH, Master of Wine: "Qvevri wines are the trump card of Georgia"
03.04.2016 (Hvino News). In March 2016 the UK-based Institute of Masters of Wine sent its delegation to Georgia. The first “Masters of Wine Trip to Georgia”, organized in cooperation with Georgian Wine Association, was a highly professional event, which envisaged retrospective tastings of indigenous grape varieties as well as microvinifications of high-quality rare Georgian varieties. Hvino News has interviewed the participants of “Masters of Wine Trip to Georgia”. Today we publish the first interview from this series, wishing to thank the Institute of Masters of Wine for invaluable support. Our guest is Rod SMITH, Master of Wine, owner of the Riviera Wine Academy. He kindly agreed to share impressions about trip to Georgia. Hvino News: Please tell us about yourself, your background. What made you enter into the world of wine? 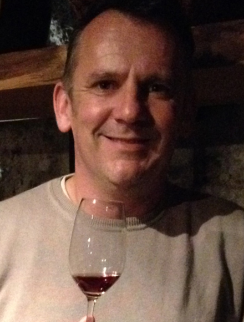 Rod Smith: I fell into wine by taking a job at Christmas in a UK store called Oddbins when I was seventeen. It was an education in wine enthusiasm and I have been involved in wine ever since. How the idea of this MT trip to Georgia came into being? Why you became interested in it? Lisa Granik MW I think is the person to thank for making this trip happen. Although she lives in the States, there is Georgian in her blood, and she knows and is well known to all the Georgian producers. And loved, as we were to discover. For me, it was an easy decision – a country I had never visited that makes wine was always going to be of interest. But one that has made wine for 8000 years – that is very special indeed. I believe this was the most over-subscribed MW trip ever. From professional standpoint, was your visit to Georgia a valuable experience? 01.04.2016 (Hvino News). American distiller Pearl Rock will use ancient Georgian qvevri technology to produce high-quality brandy. Last month Hvino News reported that Georgia's patent authority Sakpatenti registered unique method of whiskey distillation using traditional qvevri - Georgian earthenware vessel (read more here). The U.S. producer Pearl Rock Wine and Brandy Company, which has bought the Georgian patent, is planning to use clay vessels for bottling brandy. According to company press release, "Clay bottles are a revolutionary concept for brandy distillation industry, which builds upon the centuries-old qvevri tradition, known in the country of Georgia". Pearl Rock decided to use clay bottles only for its top product - 12 years matured brandy. It is not known if Pearl Rock would be importing clay or bottles directly from Georgia, or use local material. According to Qvevri Manufacturers Association, several other American and European distilling companies showed interest in Georgian technology. "Negotiations are underway with Olmeca Tequila, Torres, and two French cognac brands about exporting Georgian clay", explained the representative.